Why invest in real estate in Sri Lanka? Now is the age of real estate investment in emerging markets. Why? Because development in emerging markets is happening faster than ever before. From unprecedented urbanisation and rapid internet penetration movement to the promise of policy changes, investors are being encouraged on a global scale. Sri Lanka is a prime example of a country whose global position has dramatically shifted in recent times only to become a hotspot for property investors. One of the best ways to find out whether it is a good idea to invest in a particular country is to look at the behaviour of institutional investors. Since peace was declared on Sri Lanka in 2009, the island’s real estate horizon is attracting the attention of major pension funds from across the world as well as sovereign wealth funds. One of the reasons for this is that real estate policy in the country has begun to show signs of shifting. In Sri Lanka’s budget for this year, it was announced that real estate investment trust (REIT) regimes will soon be introduced to the country. REITs are a huge pull factor for foreign real estate investors. This is because they enable the monetisation of real estate assets and minimise risk, partly through increasing transparency – REITS are often present on public stock exchanges. New investors are wise to follow the feet of institutional investors, as these main players are a good source of knowledge when it comes to managing risk and hitting the jackpot. Demand for luxury property in Sri Lanka’s major cities such as Colombo, Negombo, Galle, and Kandy is about to soar even more than it is today. High net worth individuals are snapping up the best plots and demand for pre-constructed properties will only increase as the country develops. High demand means that prices in the future will be set higher, so if investors purchase property now, they are sure to get a much better ROI in the future. Sri Lanka’s coast is unbelievably stunning, and so it’s easy to see why wealthy people are opting to reside there. Throughout the emerging markets, people are moving from the countryside to the city as countries become increasingly developed. 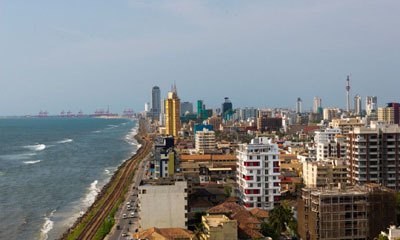 In Sri Lanka, this urbanisation is not just affecting Colombo. Other cities, including Kandy, are becoming increasingly populated. This is happening for several reasons. Firstly, cities such as Kandy have become rapidly developing hubs of new business and startups. Secondly, land-lease tax is being removed in such cities and this is also expected to encourage international corporations to move into large Sri Lankan cities. Entrepreneurs want to be close to the action, and therefore, demand for property in business hubs is booming. Thirdly, transport to and from major cities is better than ever before. The Colombo-Kandy Expressway is going to be a game changer, and this new link will further nurture real estate growth. Since Sri Lanka became peaceful in 2009, the island’s GDP has been rising at a steady pace. Growth has been fostered in areas such as internet penetration (currently at 20-25%), societal prosperity, and increased strength in commerce. Foreign Direct Investment has been increasing more than expected. FDI inward flow reached $944 Million (US) in 2014, accompanied by a GDP per capita of $3,819.20. This was up 7% on the year before. IT services exports, tourism, and remittance all contributed strongly to this growth. 2015’s FDI figures were even more impressive, and one major reason for this was new president Maithripala Sirisena’s change in fiscal policy. Sirisena’s party, the Sri Lanka Freedom Party (SLFP) favours foreign investment, and this appears to be making a big difference. There is still a way to go in terms of relaxing policy, however, Sri Lanka is going in the right direction for real estate prosperity. It is clear that if investors are hesitating about whether to invest, now is the time to get some professional advice and take the plunge. Sri Lanka won’t disappoint.